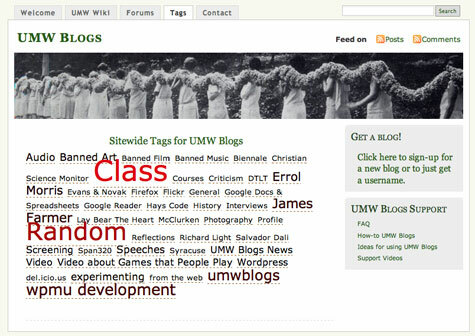 Tags on UMW Blogs are divine! I had labored over the sitwewide tags for well over a month to no avail, today was my first day on the forums in WPMuDev Premium, and within half an hour I had the fix. I feel like UMW already owes James Farmer so much for all the amazing stuff he has so generously brought back to this community. Having joined his service today, within minutes I already feel like I owe both him and Andrew Billits (the founder of WPMuDev) that much more. They’re good, very good! 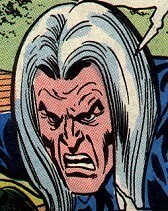 And for those of you who frequent the public WPMu forums, you might have noticed the all too conspicuous absence of Dr. Mike -perhaps the single most prolific and imaginative moderator I have yet to see in the WordPress community. Well, if you join WPMuDev, you might be in for a very pleasant surpise. Avanti Mary Wash, avanti! We’re relatively poor, but we’re also very, very scrappy! This entry was posted in wordpress multi-user and tagged categories, tags, umwblogs, WordPress, wordpress multi-user, wpmu. Bookmark the permalink.